A 30-year-old female presents with a complaint of gradually progressive weakness in all four limbs (right >left) since 3 months. Magnetic resonance imaging (MRI) brain shows ring-enhancing lesion with mild surrounding edema in the left frontal lobe. MRI spine revealed intramedullary cervical hemangioblastoma of 9 cm × 10 mm extending from cervicomedullary junction to C4 level with adjacent cord edema extending from C1 to T1 level. CT scan of abdomen revealed right renal cell carcinoma of 3 cm × 2 cm in upper pole with multiple pancreatic and simple hepatic cyst. General examination and routine blood investigations were within normal limit. Central nervous system examination, Glasgow coma scale 15/15, and pupils were normal. Muscle power in the right and left upper limb was 2/5 and 4/5, respectively, whereas in lower limb, it was 4/5. Based on these findings, it diagnosed as a case of Von Hippel-Lindau syndrome and was planned for laparoscopic radical nephrectomy under general anesthesia. Urine metanephrine and normetanephrine were within normal limits which ruled out the pheochromocytoma, that is, usually associated with this syndrome. In view of quadriparesis, because of cervical hemangioblastoma and undergoing laparoscopic nephrectomy, it was decided to give general anesthesia with continuous quadratus lumborum (QL) block on the side of the surgery and single-shot QL block on the opposite side was planned to provide complete postoperative analgesia., After explaining procedure, written and informed consent a night before surgery, she was given tablet lorazepam 1 mg and tablet rantac. All standard American Society of Anesthesiologists monitors and an invasive blood pressure monitoring were taken in operation room. After achieving adequate muscle relaxation with balanced general anesthesia, oral fiberoptic intubation was done with 7.5 number cuffed endotracheal tube to avoid any unwanted neck movements. 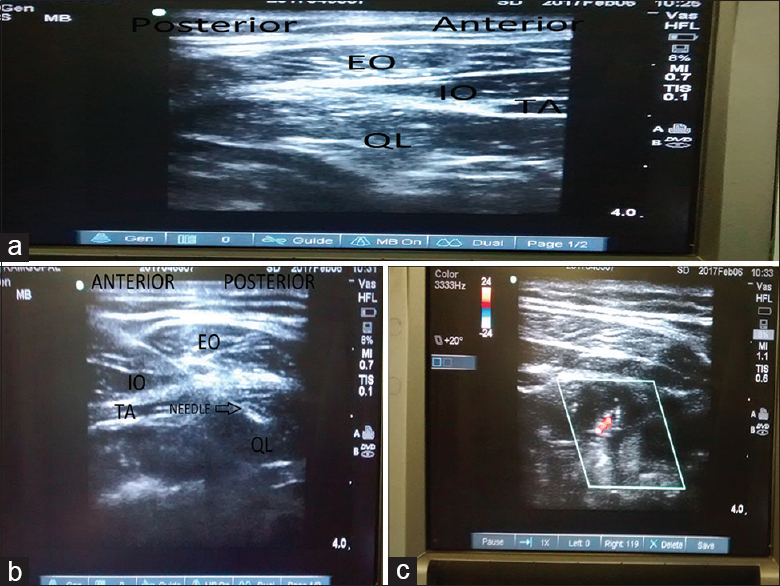 While the patient was supine and under all aseptic precautions, linear ultrasound probe (SonoSite, USA) continuous QL block was given in right side as shown in [Figure 1]a. Using in-plane technique, 18-gauge Tuohy's needle was inserted until its tip reaches between QL muscle and thoracolumbar fascia as shown in [Figure 1]b. Normal saline 5 ml was injected to separate the fascial planes. Then, 20-gauge polyurethane epidural catheter (BD India Ltd.,) was inserted. While keeping the catheter in position, Tuohy's needle was withdrawn. Catheter was tunneled under the skin and fixed in situ with tegaderm and micropore. After negative aspiration for blood, 15 ml of 0.2% ropivacaine bolus was given [Figure 1]c. Similarly, on the left side single-shot QL block using an inplane technique, 23-gauge spinal needle is inserted in between lateral border of anterior abdominal wall muscles and QL muscle until its tip reaches in between thoracolumbar fascia and QL muscle. Correct position of needle tip was confirmed using 5 ml of normal saline. Then, 15 ml of 0.2% ropivacaine was given after negative aspiration of blood. The left side QL was given to take care of the abdominal wall stretch pain which is caused by tearing of small blood vessels, traumatic traction of nerves, and release of inflammatory mediators. Surgeon was asked to proceed for the surgery after 20 min. Intraoperative hemodynamic remained stable after 5 h of laparoscopic nephrectomy procedure. About 5–7 cm of subcoastal incision is given to retrieve the kidney (that may result in moderate postoperative pain for more than 24–48 h). The patient was extubated on table after adequate reversal. Postoperatively, 0.2% ropivacaine started at 5 ml/h which was continued for next 48 h throw continuous block. The catheter was removed on 3rd postoperative day. The patient postoperative period was comfortable. No additional rescue analgesics were required. Visual analog scale score and highest sensory level achieved are shown in [Table 1]. QL block can provide effective postoperative analgesia and can be used effectively as a part of multimodal approach for relieving postoperative pain. Ueshima H, Otake H, Lin JA. Ultrasound-guided quadratus lumborum block: An updated review of anatomy and techniques. Biomed Res Int 2017;2017:2752876. Blanco R, Ansari T, Riad W, Shetty N. Quadratus lumborum block versus transversus abdominis plane block for postoperative pain after cesarean delivery: A randomized controlled trial. Reg Anesth Pain Med 2016;41:757-62.